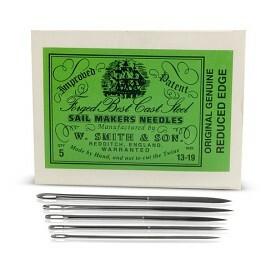 Hand Sewing Needles, by W. Smith & Son, are the best sailmaker’s needles available. 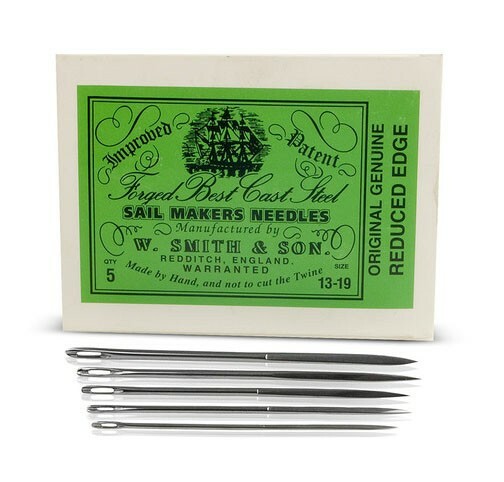 Forged in England from cast steel with reduced edges, these needles also feature triangular points and sharp edges to cut through the fabric. The sharpness makes it easy to pass through heavier fabric assemblies. A long eye makes threading easier. Sailmakers use triangular shaped needles to open larger holes in the fabric to cut down on chafe problems when a long length of twine is repeatedly pulled through. Needle size increases as the number decreases. The #16 needle is good for most work, but as a general rule use larger needles for sewing through many layers of fabric and smaller needles for seaming work. Simply use the needle that yields the smallest hole without undue trouble.